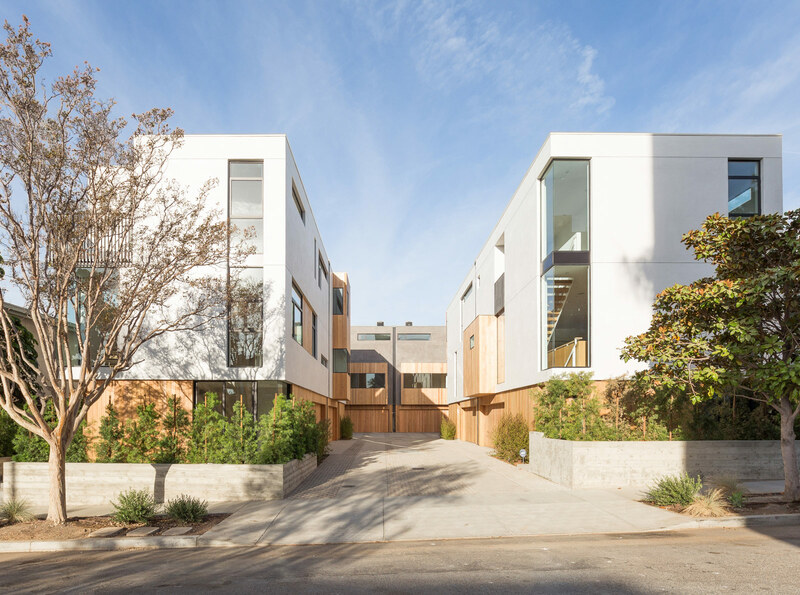 Los Angeles–based architects Rios Clementi Hale Studios (RCH Studios), Riley Architects, and Integrated Development recently debuted Habitat 6, a collection of six new single-family homes in Los Angeles’s Los Feliz neighborhood. The project is made possible by L.A.’s “small-lot subdivision” ordinance, a special land use maneuver instituted back in 2005 aimed at increasing the availability—and density—of single family housing across the city’s existing neighborhoods by allowing developers to subdivide existing lots into multiple properties to build collections of detached single-family residences. More controversially, the project is also the result of a protracted preservation struggle that resulted in the demolition of the Oswald Bartlett House, designed in 1914 by visionary Los Angeles architect Albert C. Martin. Applications for cultural monument status for the home were denied in 2014, paving the way for its demolition and replacement with RCH Studio’s units. As with most small-lot subdivision projects, Habitat 6’s site is organized around a central driveway used to access each unit’s two-car garage. In a nod to the normative tract house, each home features a small ground-floor yard. The homes range in size from 1,954 to 2,106 square feet and feature a flexible room on the ground floor, combined living room, kitchen, and dining areas along the second floor and two bedrooms, each with en-suite bathrooms, on the floor above. Each home sits on a Douglas Fir wood-clad parking plinth, while the buildings’ exteriors are clad in expanses of white stucco interrupted by vertical bands of floor-to-ceiling punched picture windows. Some of these openings wrap the corners, while others are contained within wood-clad recessed and pop-out volumes. The units’ apertures are positioned such that neighboring homes do not face into one another. Inside, living room areas are designed with 10-foot ceiling heights (generous by Los Angeles standards), and feature clean, white walls accented with raw wood planks. Other interior finishes include marble countertops and backsplashes in the kitchen, and tile and board-formed concrete wall surfaces. 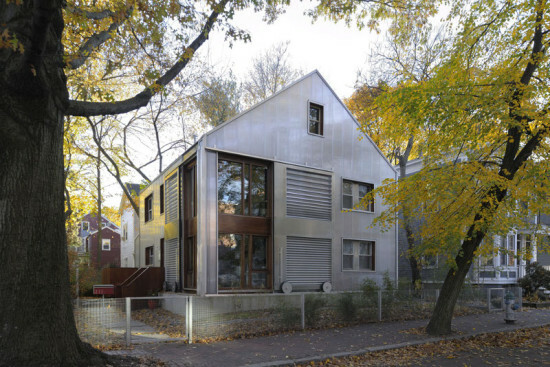 A translucent polycarbonate skin transforms an early-19th century Massachusetts home. On a well-traveled street in Cambridge, Massachusetts, about halfway between Harvard University and MIT, sits a house not like its neighbors. Its simple massing and pitched roof indicate old bones. But its skin is all 21st century. The house, recently renovated by Alessandro Armando and Manfredo di Robilant, is clad in translucent polycarbonate panels that reveal the structural and insulating layers beneath. For the architects, the project was an experiment in applying a cladding system designed for large-scale projects to a single-family home. “We thought this could be a possible test-bed for something more standard, something that could at least be thought of as a standard way of renovating and improving a typical American detached house,” said di Robilant. “This house is very small, but we’re now trying to fit it toward possible standardization of this approach.” When Armando and di Robilant first visited the house, its facade was in bad shape. Disintegrating wood topped by a layer of metal siding (from a 1960s update) failed to protect the home from Cambridge’s snowy winters and hot summers. The architects peeled away the old materials and thickened the facade’s profile, beginning with a layer of rigid Thermax insulating panels. Around this they built an external skeleton of TimberStrand with Parallam columns, to shore up the house’s structural system. 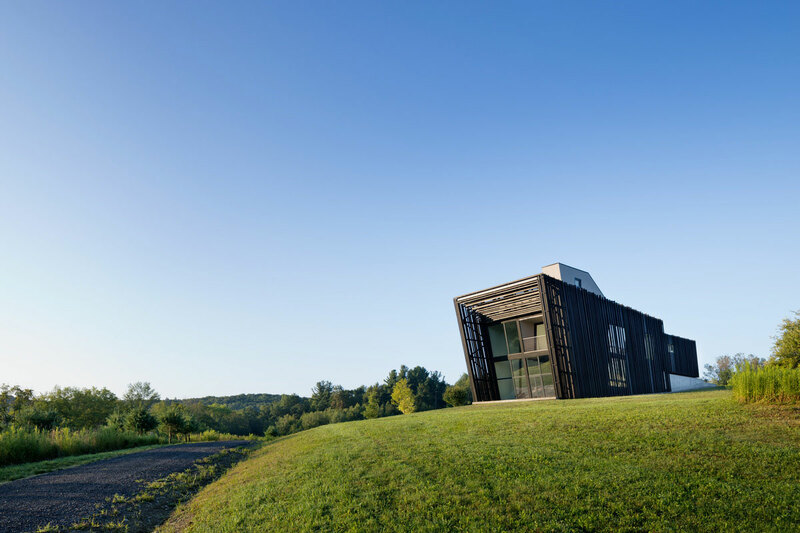 To the timber frame they attached 40-millimeter polycarbonate panels by Rodeca. The Rodeca panels further insulate the house and offer UV protection, but they are transparent enough to provide a glimpse of what lies beneath. “The insulation panels are not directly exposed to the air, but you can see them from the outside,” said Armando. “You can see all the layers, this was one of the main features we expected to achieve, to reveal all the exterior coloring of the house.” The air gap between the inner and outer layers of insulation further boosts the home’s thermal performance, as it funnels hot air up and out before it reaches the interior. There were a small number of bungalows built here in 1907 and 1908, and another handful in 1910. But Mary Ellen Guest, the association's executive director, said that the building of bungalows really picked up a century ago. Bungalows really started to catch fire in 1913 and 1914," Guest said, in large part because a population boom was underway. The city grew by more than 500,000 people—from 2.2 million to 2.7 million—between 1910 and 1920, according to data from the University of Illinois at Chicago. 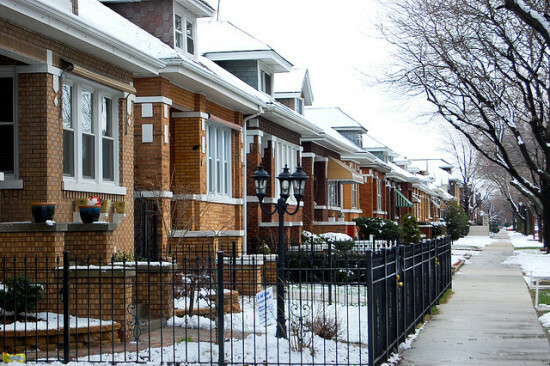 But the family makes the home, after all, and Amer’s article ultimately puts its focus on Chicago area homeowners who share an affinity for the building type. Take a multimedia tour here.